Are you a WordPress website owner or a provider of WordPress Development services? Let us ask you one question. Is your WordPress website highly secure? The answer might be no in many cases. Although, WordPress core comes with many security features built-in the things you build on it might not be that much secure. Let us share why you need 8 WordPress security plugin for your website. The security plugins for WordPress comes with features such as Active security monitoring, File scanning and Malware scanning which protect your websites from attacks. As you know in the era of Information Technology, Information drives the value and it needs to be protected with good security. Let us explore some security plugin for your WordPress website. Sucuri Security plugin is a widely used security plugin and comes in two versions. One is a free version with limited features, and another one is paid version with features such as website firewall and many others which require you to play for a Sucuri plan. If you feel that basic free security is enough for your blog, then you should not go for a paid plan. The free version comes with many widely used features such as with security activity auditing which allows you to check how well the plugin is protecting your site. Other features of the plugin include security notifications, security hardening, integrated monitoring, and blacklist monitoring. The paid plan includes more frequent scans and offers customer service channels. For example, if you want a scan to be done every 12 hours; you will need to pay $17 for each month. Allows multiple variations of SSL certificates. It is a paid feature though. Customer service is available via email and instant chat. Real-time notifications when something goes wrong with the website. If you wish to stick with free version only, you will be able to use blacklist monitoring, malware scanning, and security hardening. Wordfence Security highly popular WordPress security plugin. This plugin offers simplicity with powerful tools. It provides robust login security features and incident recovery tools. Wordfence also presents you with a dashboard and allows you to gain insight into overall traffic trends and hack attempts. Wordfence offers impressive free features which include tools such as Web Application Firewall and brute force attack protection. Although free version has many tools, more premium version is also worth to use which is available at $99 per year for one website. If you are a website development agency, you will surely get discounts when you sign up for multiple sites. If you purchase 25 keys for 25 websites, the price you will pay for each website will be around $29 per year. If you are a developer and if you are developing multiple sites which need a higher degree of protection, the discount will really help you. The free version provides enough features for small websites. Developers can save a huge amount of money while signing up for multiple keys. Includes a full firewall suite with tools for blocking, a web application firewall, brute force protection, and real-time threat defense. 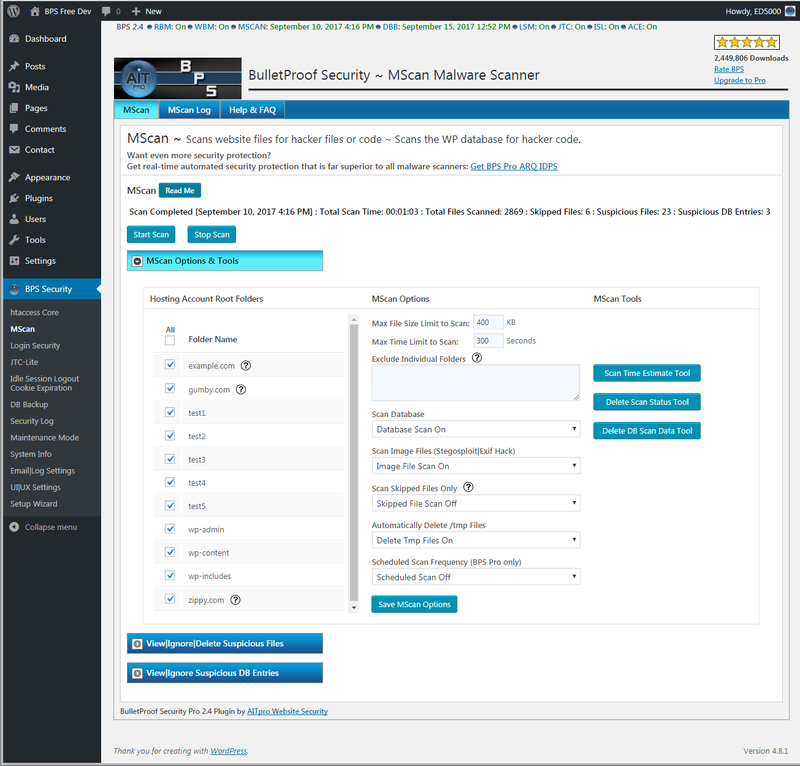 The scan option protects against malware, real-time threats, and spam. The plugin also monitors live traffic and observes thing such as Google crawl activity, human visitors and bots. Option to perform password auditing. 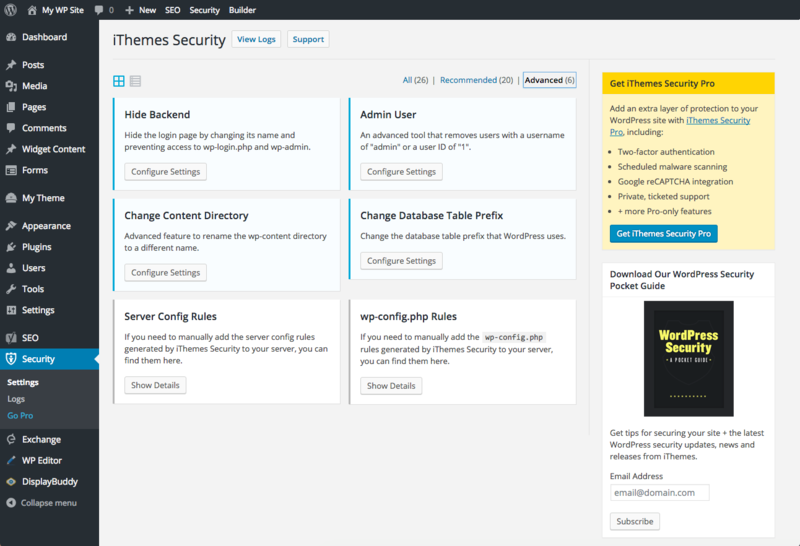 iThemes Security is a highly impressive plugin to protect your website. It offers more than 30 features to protect against hacks and unwanted intruders. It focuses on recognizing vulnerabilities and weak passwords. Basic security features come included in a free version, and if you want to have more advanced features, then you can go for a pro version of iThemes Security for the price of $80 per year. Paid version includes plugin updates for one-year, ticketed support for a total of 2 websites. iThemes Security comes with a lot of features such as password enforcement, database backups, and two-factor authentication. You can also activate 30 total security measures which make iThemes Security Pro an excellent value for money. Although these features are good enough for basic security of your website, you can go for more advanced features by obtaining a more expensive plan. Google reCAPTCHA integration for an added layer of protection to your login. Compares your WordPress installation with the currently available version which helps you check if anything malicious is placed in your WordPress core files. Adds one more layer of complexity to your authentication keys. 404 detection, strong password enforcement and brute force protection. All in One WP Security & Firewall provides easy to use interface. The most notable point about this plugin is, it provides customer support without the need for purchasing premium plans. All in One WP plugin focuses on visual representation with graphs to explain parameters such to display what actions are needed to make your site stronger. This plugin provides features in 3 categories which are: Basic, Intermediate, and Advanced. This plugin protects user accounts by blocking forceful attempts on your login. It also enhances user registration security, database, and file security. You can backup and restore .htaccess and .wp-config files. The plugin shows one graph to specify how secure your website is and a diagram that designates points to specific areas of your site. VaultPress works similar to other WordPress Security plugins. VaultPress comes only with paid plans starting at $39 per year. The basic plan is more suitable for small businesses and bloggers. More powerful plans are available at $99 or $299 for 1 year. VaultPress provides daily and real-time backups. This is the main feature they are promoting. They have also included calendar view for specifying when you want to complete your backups. Just like the backup; restore functionality is also very easy. The backups are incremental which is great for performance. The security tools monitor activity on your website. In the dashboard, there are tabs for checking your history and threats which have been found. 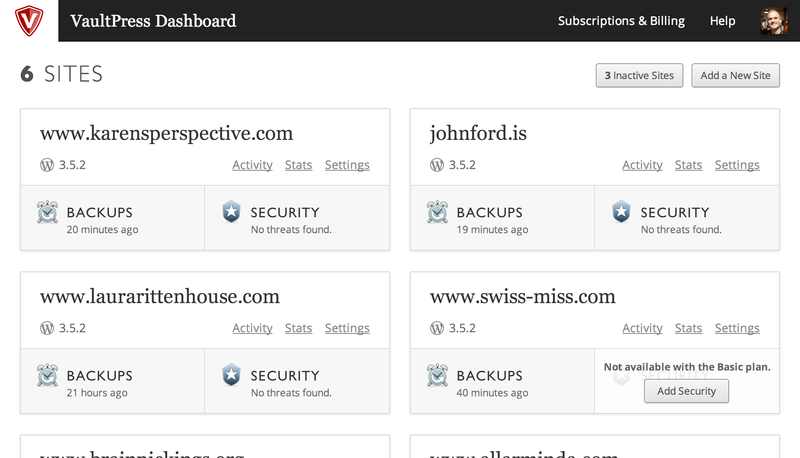 You can also manage your entire security details from the clean dashboard. Pricing of the paid version is better than many other WordPress plugins. The dashboard is sleak and easy to use for administrators. You can schedule backup in real-time or manually using built-in calendar. The stats tab provides information on the most popular traffic hours, also shows what threats have occurred in those times. You can easily contact the VaultPress support team to help you with tasks such as site backups and restore. SecuPress is a recently released security plugin in the market but it is growing popularity quickly. There is a free version as well as a paid version which includes many additional features. This developer of the plugin is Julio Potier, the original co-founder of WP Media, they have developed WP Rocket and Imagify. If you want a security plugin that has a great User Interface then, SecuPress is surely the plugin to choose. The free version comes with a firewall and ability to protect against brute-force attacks. It also protects your security keys from bad bots (this feature is available at a cost in other plugins). Their premium versions start at $59 and come with features such as two-factor authentication, PHP malware scans, and PDF reports. The UI in SecuPress is very easy to use, even for beginners. The premium version allows you to check 35 security points in 5 minutes, generate a report, and harden your site. This plugin can change the WordPress login URL of your site to protect against bots. Helps you detect vulnerable themes and plugins which have been tampered or malicious code. The BulletProof Security also comes with 2 versions, first is a paid one and another is a free one. The paid option is available for $69.95 and provides more features than most other security plugins. BulletProof provides 30-day money back assurance if you aren’t satisfied with their plugin. The paid plugin includes anti-spam, quarantines and email alerts. The UI isn’t easy to use but gets the work done. Developers can take advantage of unique settings such as Base64 decoder and anti-exploit guard. It also has a wizard feature to make things easier. Unique advanced security tools with features such as Intrusion Detection, Intrusion Prevention, encrypting solutions, scheduled cron jobs, and folder locking. The free version comes with enough features for basic protection. The database backups are available in free version. The maintenance mode functionality is also available which other security plugins may not offer. The free module consists of more than 50 security tests ranging from checking MySQL permissions, file permission and also covers many other PHP settings. Security Ninja also includes a brute force check combined with weak passwords check. It also has an auto fixer module which offers “just click here to fix it” approach. Whereas, another mode provides an explanation of each test to manually fix the security issue with code which you can use to fix it. Paid version starts at $29 for each website. 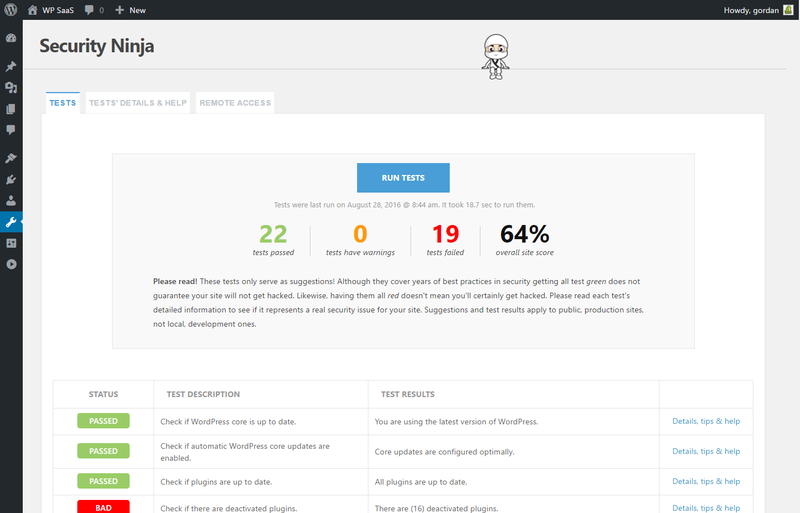 Free version performs more than 50 security tests. Auto fixer module resolves any issues automatically. Scans your site’s WordPress core and compares them to a secure copy from wordpress.org to check the integrity of files. Scan plugins for suspicious code and malware. Log all events that are happening in your site. Better to take action now rather than getting hacked. We hope that this article will help you to understand how important it is to keep your website secure. It doesn’t matter whether you are having a blog or E-commerce website built using WordPress; security of your website should be one of your highest priority. Did you like our curated list of 8 Most useful WordPress security plugin for your website? How much helpful this article was for you? Let us know in the comment section! Don’t worry about the security of your website, we will take care of it. Working with an experienced WordPress Website Development Company is an effective way to ensure that your website is built with security in mind. We are one of the top web design and development agencies located in India. We offer Custom WordPress web development services in India and around the globe. Our area of expertise also includes custom website design and mobile app development. Connect with us to build your next website.